The Seraphs are generally accepted to be the highest order of God's Angelic Servants. They stand by God's throne chanting "Kadosh, Kadosh, Kadosh" - "Holy, Holy, Holy is the Lord of Hosts, the whole earth is full of His Glory." (Isaiah 6:3) They are beings of pure light and thought and have direct communication with God. They resonate with the Fire of Love. They appear with six wings and four heads. According to Enoch, there were only 4 Seraphim, which corresponded to the four winds or directions. Later commentators interpreted this as there were 4 major princes who ruled over the Seraphim. They include either Metatron or Satan, Kemuel, Nathanael, and Gabriel. It is possible that the earlier passages refer to a class of demons. Another interpretation is that the word comes from rapha meaning healer and ser meaning higher being. There is much confusion in the ranks of angels. Some of the Seraphim are considered Archangels, even though the Archangels are ranked six orders below that of the Seraphim. Metatron is sometimes identified as Satan, Prince of Darkness, or "old dragon." He is said to possess 36 wings and countless eyes. Genesis 3:24 says of that God placed "on the east side of the Garden of Eden cherubim and a flaming sword flashing back and forth to guard the way to the tree of life." The Hebrew word Kerub is translated by some scholars as "one who intercedes" and by others as "knowledge." The original Karibu were the terrible and monstrous guardians of the temples and palaces in Sumer and Babylon. There were also similar guardians in the Near East, and there were winged, eagle-headed deities that guarded an Assyrian Tree of Everlasting Life. They are said to have 4 wings and 4 faces. Exodus 25 talks of how the Ark was to be decorated with Cherubim, while 1 Samuel 4:4 says that the Lord is "enthroned between the cherubim" on the Ark. Psalms 18:10 speaks of the Lord, who "mounted the cherubim and flew; he soared on the wings of the wind." The Ophanim seem to be God's actual chariots. The Hebrew Galgal has the double meaning of wheels and of "pupil of the eye." Ezekiel 1:13-19 "with them was something that looked like burning coals of fire. This fire, suggestive of torches, kept moving about among the creatures; the fire had a radiance, and lightning issued from the fire. Dashing to and fro [among] the creatures was somethig that looked like flares. As I gazed on the creatures, I saw one wheel on the ground next to each of the four-faced creatures. As for the appearance and structure of the wheels, they gleamed like beryl. All four had the same form; the appearance and structure of each was as of two wheels cutting through each other. And when they moved, each could move in the direction of any of its four quarters; they did not veer when they moved. Their rims were tall and frightening, for the rims of all four were covered all over with eyes. And when the creatures moved forward, the wheels moved at their sides' and when the creatures were borne above the earth, the wheels were borne too." The thrones are said to reside either in the third or the fourth heaven. They are said to inhabit a region in which Heaven meets Earth. Raphael is thought to be the ruling Prince. These angels are said to "regulate angels' duties" according to Dionysius. They are described as Dominions, Lords, Kuriotetes, or Hashmallim. They have been said to reside in the second heaven, where the celestial letters of the Holy Name reside. The ruling Princes are said to be Zadkiel, Hashmal (aka Chasmal or the "fire speaking angel"), Yahriel, and Muriel. These angels bestow blessings, usually in the form of miracles. They are also known as Malakim, Dunamis, and Tarshishim. They are associated with heroes and instill courage, and are known as "The Brilliant or Shining Ones." The Virtues escorted Christ to Heaven during the Ascension and according to the Book of Adam and Eve, were present at the birth of Cain. 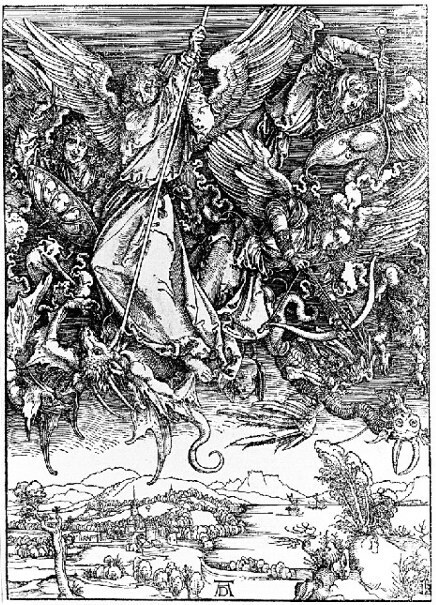 The leaders are said to be Michael, Gabriel, Raphael, Bariel, Tarshish, and Satanel (before his fall). The Powers are also known as the Dynamis, the Potentiates, and the Authorities. They are said to be the first angels created by God, and are said to reside along the border between the first and second heavens. Their job is to guard against demons. Camael is the leader of the order. His name means "he who sees God" and the Magus suggests that he is one of the seven angels who stands in the Presence of God. Camael is also identified as a Duke of Hell. He is said to have the body of a leopard. Others believe him to be associated with Mars, the god of war. He also is commander of Destruction, Punishment, Vengeance, and Death. As Kemuel, he acts as a mediator between Israel and the Hierarchs of the seventh heaven. Legends surrounding Camael claim it was he who wrestled with Jacob, he appeared to Jesus in the Garden of Gethsemane, and even that he tried to prevent Moses from receiving the Torah from God. The Powers are said to be the angels who guide the soul. They try to balance the good with the bad in hopes that the bad will not overpower the good, and hence, the individual will fall to the darker side. It is also said that they guide souls that have left the body and have lost their way. The Principalities are those angels who are in charge of nations and great cities on Earth. Later they became the protectors of religion. Several possible leaders are Nisrock, who is originally an Assyrian deity who sometimes is considered the chief chef to the Demon Princes of Hell. Another possible chief is Anael, who is one of the seven angels of creation. He is associated with human sexuality, and is also governor of the second heaven. Other Principalities include Hamiel, who transported Enoch to Heaven (although he is also known as the Chaldean deity Ishtar) and Cervill, the Prince of Strength, who is said to have aided David when he slew Goliath. In Jewish and Christian sources, there are seven Archangels, while in the Koran, there are said to be only four - only two are named: Jibril (Gabriel) and Michael. The Jewish and Christian sources differ in who they name as their seven. All agree on Michael, Gabriel, Raphael, and Uriel. The other three are either Metatron, Remiel, Sariel, Anael, Raguel, and Raziel. These angels are the most important intercessionaries between God and humans, and they are in constant battle with the Sons of Darkness. The last order of the hierarchy is that of the Angels. The Hebrew term for angel, mal'akh means "a messenger, while the Sanskrit is Angeres, which becomes the Persian angaros ("courier"), and finally, the Greek angelos. They are intermediaries between God and human mortals.